Vacation rental house. 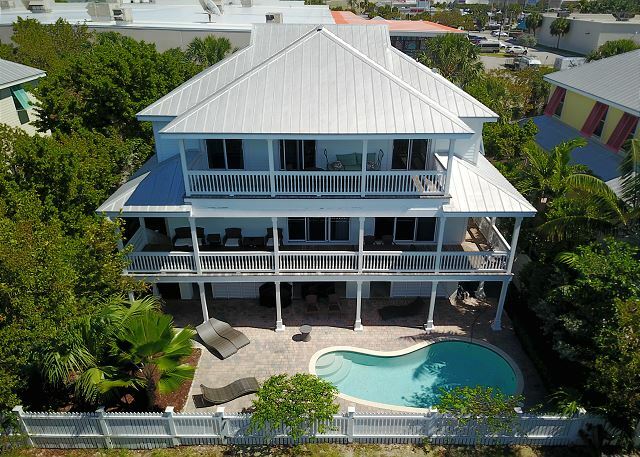 Sleeps 8, 4 bedrooms, 4 bathrooms. Dogs allowed. Here is a photo of the home from a drone over the water. If you’re looking for a luxury escape on the water, Paris Mango is your island gem. Named after Jimmy's "Last Mango in Paris", your luxury leather seating throughout will transport you to the lifestyle of the rich and famous. 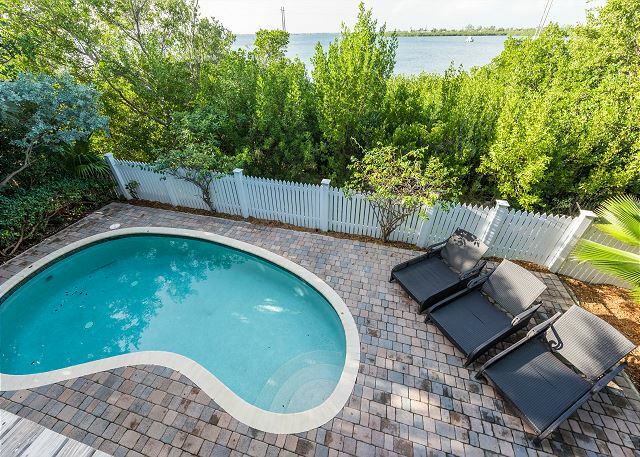 Enjoy the island life in your own oasis tucked away from the bustle of Old Town in a private waterfront retreat, with your own private heated pool. Luxurious furnishings and spacious interiors centered around the expansive water views perfectly compliment the beautiful outdoor spaces. Slow down, relax and prepare for life the way it should be at Paris Mango. 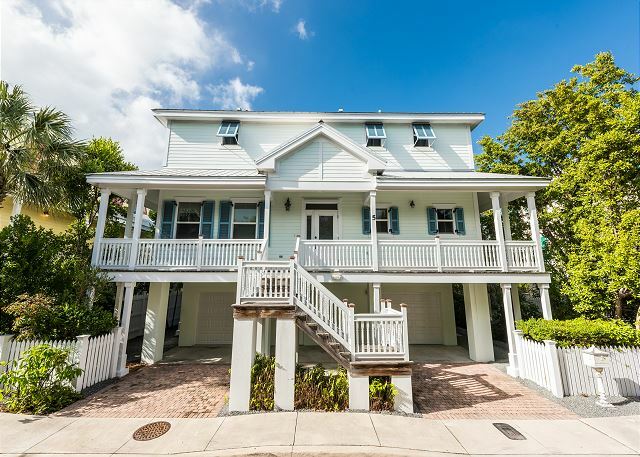 ***This home is available for lease by the month, in accordance with local ordinances strictly enforced by the City of Key West. The minimum lease is for 28 nights. 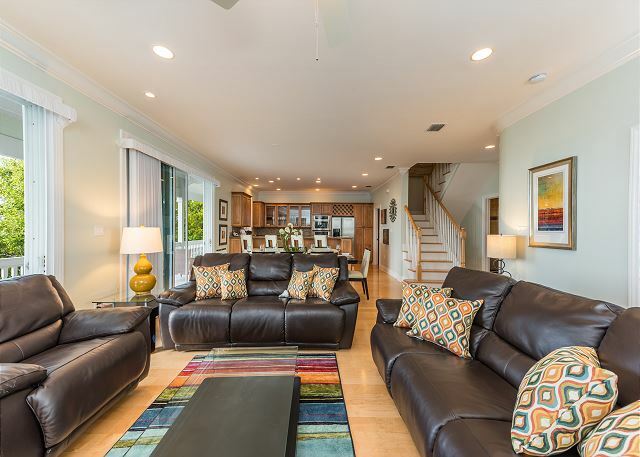 LOCATION: This home is located in the gated community of Key Cove, on an exclusive lane of waterfront residential homes. 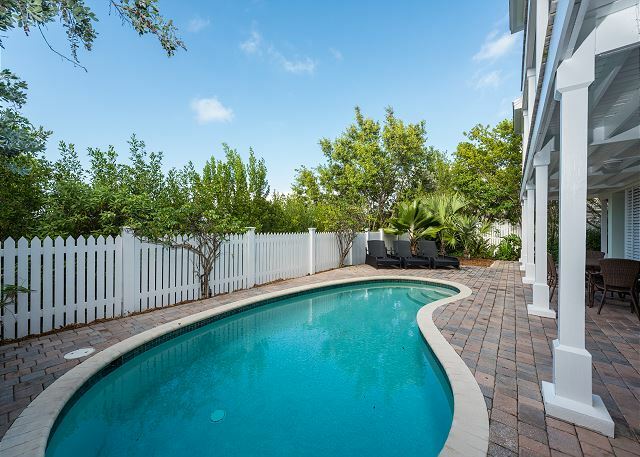 The perks of this little-known location are many: walking distance to the essentials such a Publix grocery store and the largest shopping center on the island, while still being tucked away in your own quiet neighborhood. The excitement of downtown Old Town is just a few minutes away by car, moped, or bicycle. 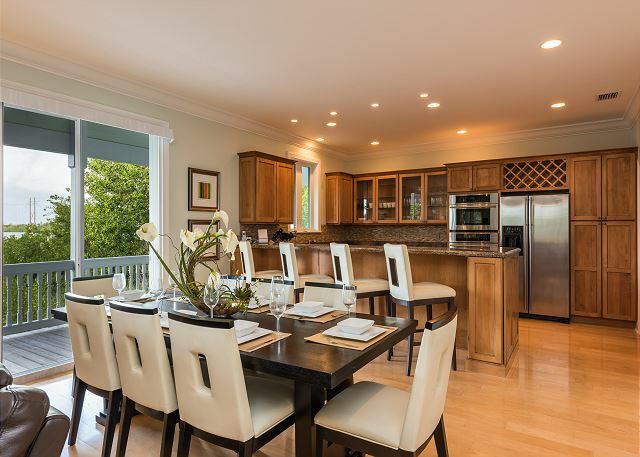 This home includes plenty of off-street parking in the private garages. LIVING AREA & KITCHEN: The main entrance to this home is at the top of the stairs leading from the ground level. This home’s highlight is the wall of floor-to-ceiling windows facing the water to provide the optimal view from every part of the house. The large open plan living room has a spacious seating area with leather couch around a large HD flat screen Smart TV. There is a dining table with seating for 8, with additional seating at the kitchen bar on white leather stools. The gourmet kitchen has state-of-the-art appliances and is fully equipped with all the tools and utensils one could want or need. The sliding glass doors open up to a wide waterfront deck with additional space for a light meal, coffee, a glass of wine, or just taking in the waterfront view. 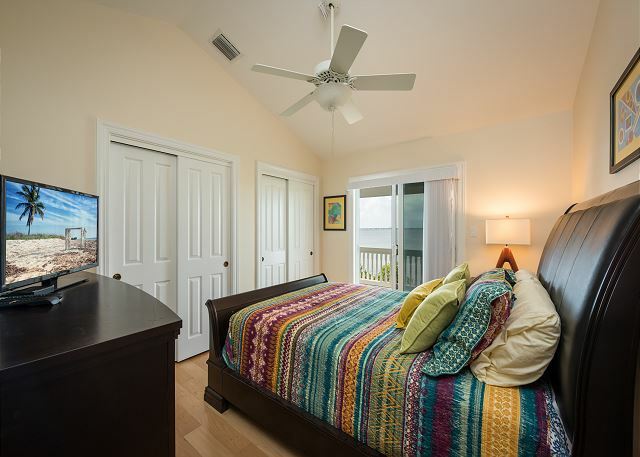 ACCOMMODATIONS: This home has two master suites, both of which are located on the top floor. The first master bedroom has a King size bed, a large flat-screen HD TV, and a beautiful two-room en-suite bathroom complete with a glass shower, large Jacuzzi tub and separate room for the facilities. 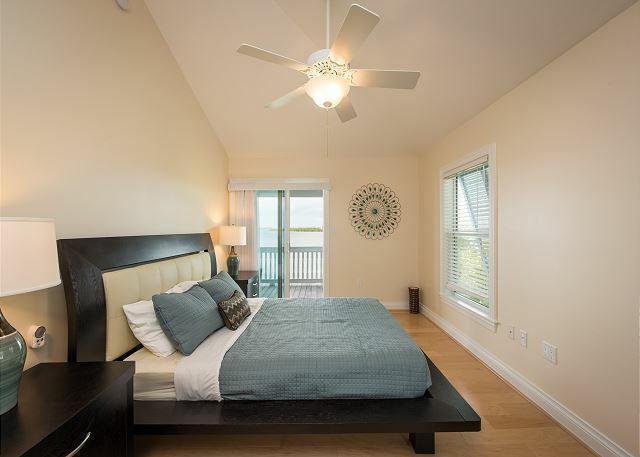 The first master bedroom also has floor-to-ceiling glass doors opening out to your waterfront balcony, with gorgeous water views. The second master suite is down the opposite hallway, with a Queen size bed and an en-suite bathroom. The second master suite also has a flat-screen HD TV, large walk-in closet, and a sliding glass door with access to the waterfront balcony. 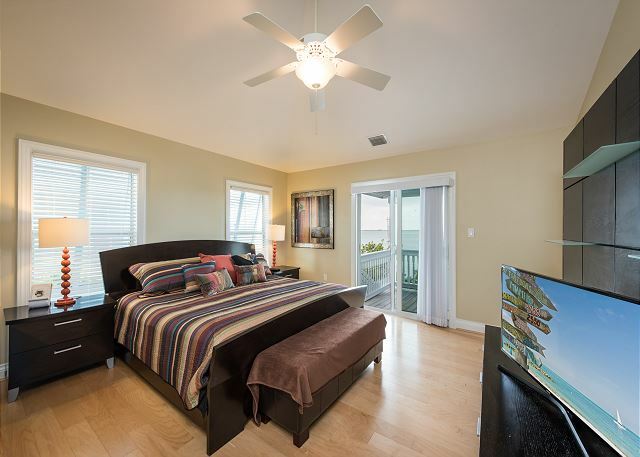 The third bedroom is beside the second master suite, with one Queen bed and a flat screen TV. 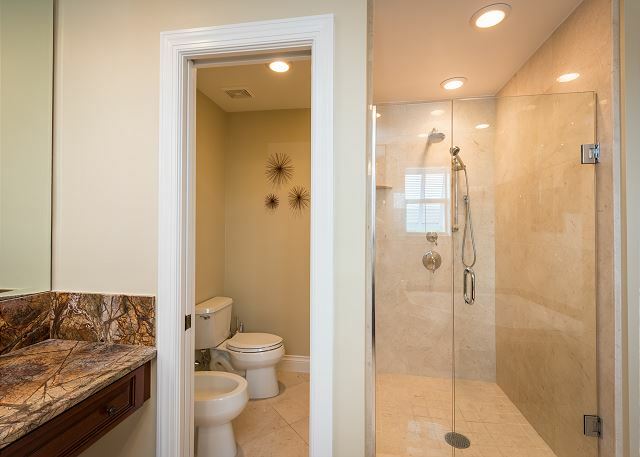 An additional bathroom is situated in the hall next to the stairs and across from the third bedroom. On the main floor there is a fourth bedroom with two twin beds that seamlessly convert to a King bed upon request. This bedroom also has a flat screen TV, and a full bathroom down the hall. 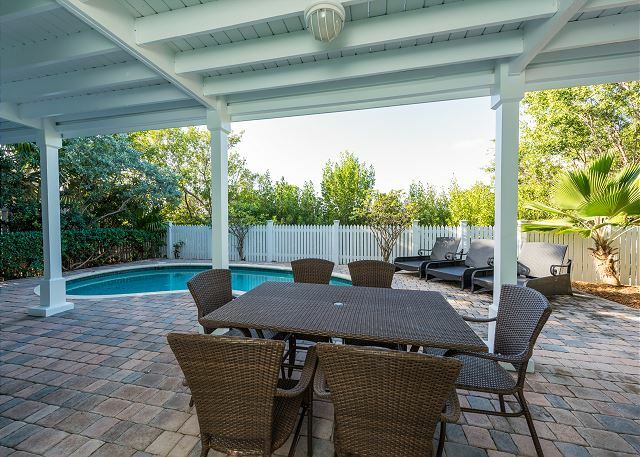 LANAI: On the ground floor is the covered outdoor dining area comfortably seating six and has ample room for entertaining with large lounge chairs. 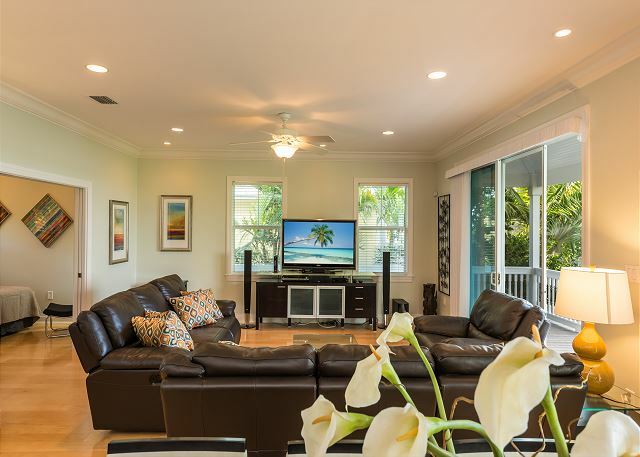 With views of the open water and visiting heron on the tropical greenery that surround the back yard, your guest will enjoy the natural splendor Paris Mango and Key West have to offer. The backyard is complete with a large grill. Additional space under the house also offers another covered indoor/outdoor area for playing, additional storage, etc. 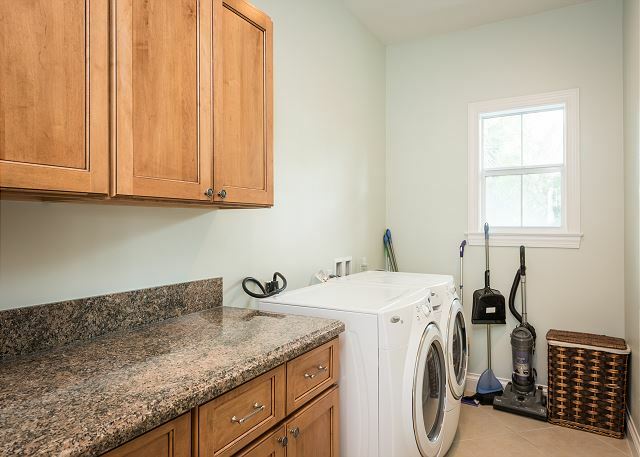 AMENITIES: Washer & Dryer, Central Heat and A/C, Ceiling Fans, Off-Street Parking in Garage & on Driveway, Flat Screen State-of-the Art Smart HD TVs in all bedrooms and main living area, Fully Equipped Chef’s Kitchen with Gourmet Appliances, Linens and Towels provided. Interim housekeeping provided upon request. Wireless high-speed Internet access and full cable is included. Pets Considered. This property will accommodate 8-10 adults. Excellent house right on the water/bay. 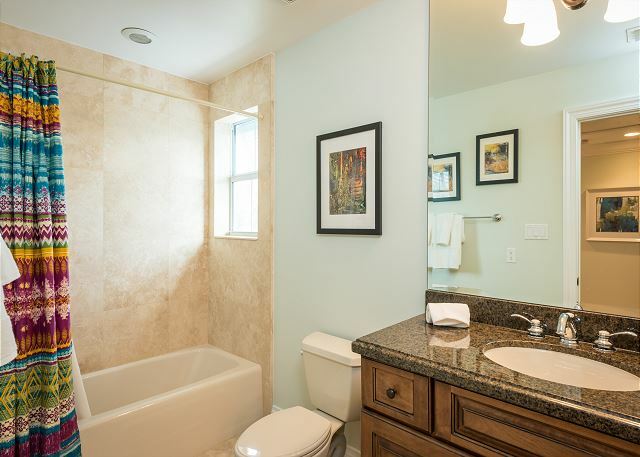 Pictures accurately depict home and we were pleased with condition. Management company were not very responsive and we had to call frequently to take care of a number of issues and obtain our $2,500 deposit credited back to our credit card. Great location with minimal noise from Home Depot behind our location. Grocery shopping and drug store very close and convenient. No house orientation information or management team available to review home details. Garage door remotes were found hidden in cabinet. We did appreciate mangrove trees being trimmed so we could see water. Sunset views were beautiful from third floor balcony. Robert B from Clearwater Beach, FL does not recommend this vacation rental. Loved, love loved the house, 2 of the 4 bedrooms had their own ensuite, 3 of the Bdrms where upstairs with the 4th Bdrm on the main level. The living,area was huge and well,furnished with reclinimg sofas, a large flat screen TV and views of the water, pool and surrounds. 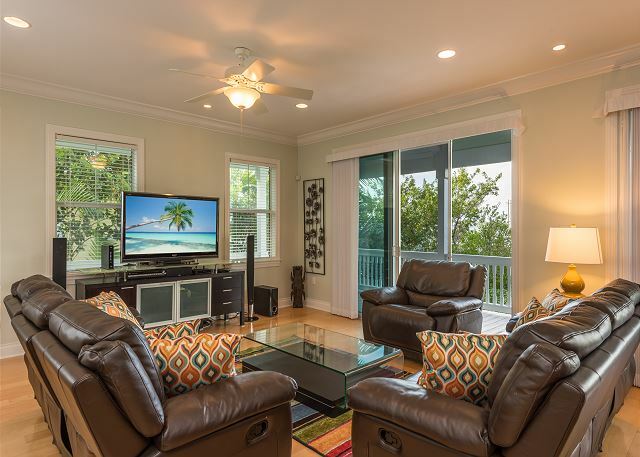 But... we did not rent this,house to stay inside and loved the location for walking to stores, restaurants and even into town, the beach, Duval street and Mallory Square. And just to get back to the house, the kitchen was well equipped, open to the living area complete with all large and small appliances... downstairs by the pool was a brand new BBQ which totally completed our experience... ok, ok, we loved the place, the setting and the location! And I must mention that Javier the Property manager was extremely attentive and helpful with each and every of our questions, concerns and wishes... to conclude... We will be back? Our family spent the month of November in the wonderful water facing home. 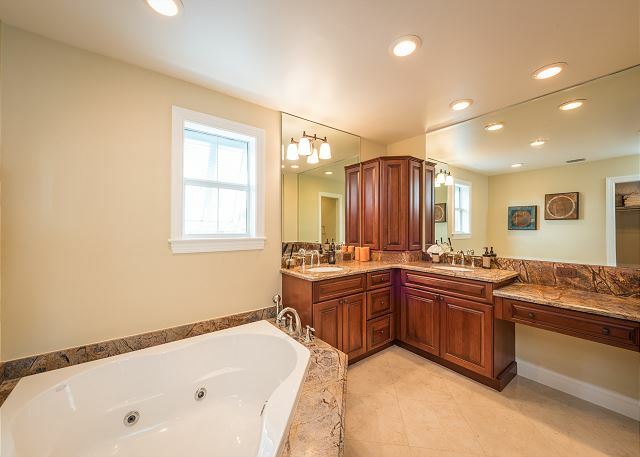 This home is equipped with all the features and items you would need for a long stay. Our family enjoyed very much all the amenities this house provides, such as the heated swimming pool large balconies on the first and second floor and ample bedrooms for family members to have Adequate space as well as privacy. 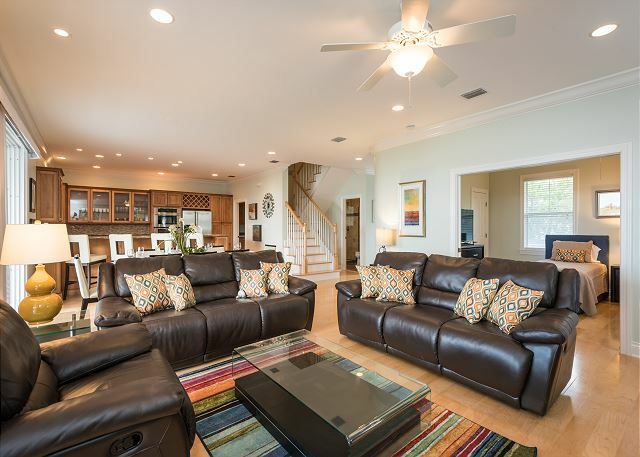 This home was just a short distance to Old town when you want to have the nightlife and or numerous restaurants. Although, Newtown provides all the conveniences just across the street like grocery stores and further shopping. It is also a short distance To stock Island which also has many restaurants and marinas to enjoy. Javier, Was an excellent host, and provided anything and everything we desired. I would come back in a heartbeat to spend another lovely holiday in this home. 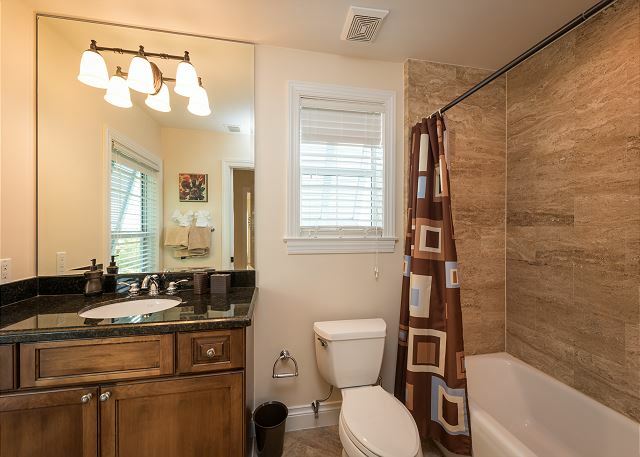 Very pleased with the Property and enjoy the space the home provides. Great house in private location. Javier was great to work with and made the process extremely easy.